Set of 4 Noritake Nippon salt dips or cellars. White with hand-painted small blue flowers & green leaves. Gold trim, shows some wear at side handles. Blue leaf mark as shown. Measure 1 7/8"d. 1891-1921. No chips or cracks. Inglenook Antiques...Established 1989. 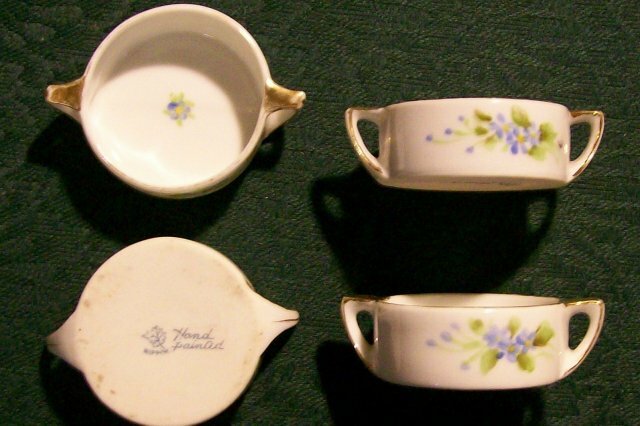 Items Similar To "Noritake Nippon Salt Dip Set of 4: Hand-Painted Blue Flowers/Gree..."